S.C. Karakaltsas was born in Melbourne and spent the first three years of her life in Singapore. Her family bought a dairy farm in Maleny, located in South East Queensland where she spent most of her childhood. As a teenager she moved to Melbourne where she finished high school and studied Economics at Monash University. She spent more than thirty years working in the corporate sector until she discovered a love for writing in 2014. 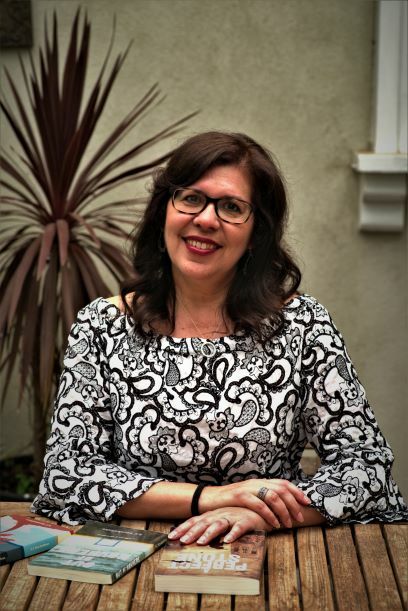 She began writing short stories in 2015 and The Surprise was shortlisted for the Lane Cove Literary Awards in October 2016 which is included in her second published book titled, Out of Nowhere – A Collection of Short Stories, released May 2017. Another story, Stanley Place Boys received the award of Highly Commendable from the 2018 Monash Wordfest. 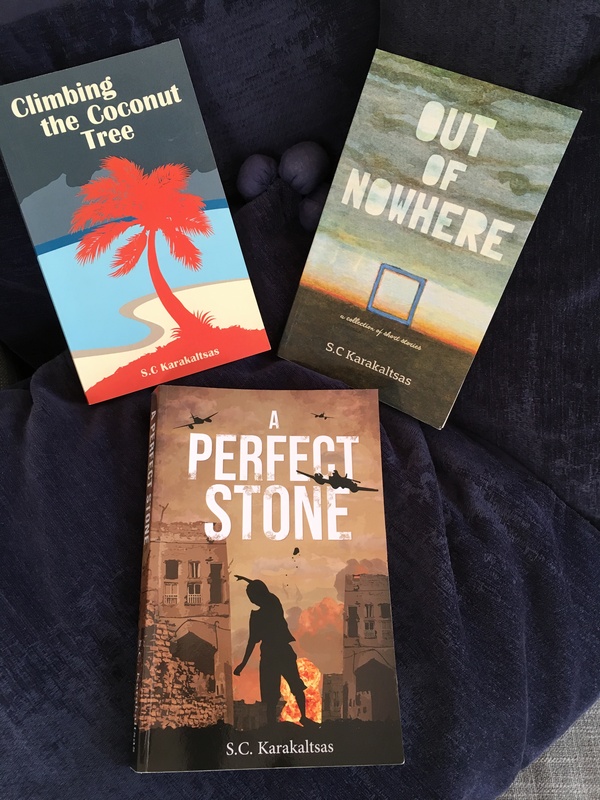 Her second historical fiction novel, A Perfect Stone, a dual timeline novel set during the Greek Civil War in 1948 and present day Melbourne, was published October 2018. S.C. Karakaltsas has always been an avid reader and now blogs about the amazing books she’s read. Great title for a book and sounds like a interesting story, is it published yet? Thanks so much. I have sent it off to quite a few publishers and am waiting for a response. I think though that I will self publish. Thanks for reading my blog. Sylvia, congratulations! Can’t wait to read the book, the blog is teaser! Thanks for reading my blog. I expect the book to be available in the coming weeks. I love what you’re doing with your blog, and I find your novel intriguing. I too want to share my father’s story as a historical novel but don’t have the benefit of too much history. He was raised in an orphanage from an early age (therefore, quite a bit of fiction!). That book will have to wait until my memoir is finished, or maybe not. The header image you’ve used is just perfect. A word of caution; if you haven’t used your own image, set up a page called something like “Header Credit” or “Header Attribution” to give the photographer credit for the image. You don’t want a lawsuit for copyright infringement. Take a look at my book review blog or my writing blog at SherreyMeyer.com. Both have such an attribution. Otherwise, your blog seems to have a good foundation, and I really want some time to read more of it. Good luck with your book! PS: I’m subscribing to your blog via email. Thanks so much for your feedback. I was conscious about using copyright so used my own photo in the header. Highest and Best to you as you await your first published book of shorts, or begin your self-publishing journey. I love that when you found your father’s stories, you decided to continue his legacy by writing them into what may turn out to be a wonderful success. Fingers Crossed! Thanks so much. My book has now been published with positive feedback. I am not surprised. Congrats!!! And so lovely to meet you too. Thanks for visiting . Thanks for checking out my blog. I grew up in a lovely place called Maleny – you may have heard of it. Writing is now something I do every day where I can. Keep up the great work with your blog. Thanks so much for checking out my site too. Best of luck with yours too. Thanks for liking the post I shared from Rebeca Bryn. Your own writing journey sounds intriguing. I too am trying to write about my father – he was killed in action during WWII when I was 2. Good luck with your writing. It will be worth it. Thanks for your interest.